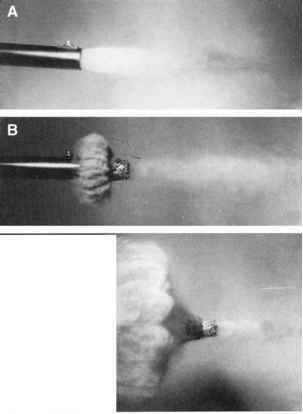 Bullets may carry materials from an intermediary target into a body as well as material from a body out with the exiting bullet.27-28 Thus, examination of a bullet recovered from a body may reveal particles of glass, wood, or paint as well as fragments of the deceased's clothing. In one case, an individual shot himself while lying next to his wife. The bullet passed through his body, entering his wife's, where it was subsequently recovered. Tissue of his blood type, which was different from that of his wife's, was recovered from the tip of the bullet. In passing through a target prior to entering a body, a bullet may have the pattern of the target impressed on its tip. Thus, one occasionally recovers lead bullets with the weave pattern of the clothing on the tip. Bullets, lead or jacketed, can have the grid pattern of a wire screen impressed on the tip if they perforate a screen. Sometimes in passing through a target the bullet may pick up material that is not immediately visible. Thus, a bullet suspected of having passed through a screen and recovered from a body had a slight area of discoloration of the tip. On examination by scanning electron microscopy with x-ray probe (SEM-EDX), the smear was revealed to be aluminum from the screen. On exiting a body a bullet may carry away fragments of tissue, bone, or even clothing overlying the exit site. The case that comes to mind was a 17-year-old male shot three times by a police officer.27 All the bullets exited. One inflicted the fatal wound, two passed through bone, with the third bullet passing through only muscle. Three bullets were recovered at the scene — one from under where the body lay. In a civil case filed against the police, it was contended that the bullet recovered from under the body inflicted the fatal wound and was fired as the deceased lay helpless on the ground. When the author examined the other two bullets, he found fragments of white glistening material embedded in the tips at the point of junction of the lead core with the copper jacket. Analysis by SEM-EDX and light microscopy revealed this material to be bone. Since only two bullets passed through bone, one of these two bullets was the fatal bullet and the bullet recovered from under the body was not the fatal one. 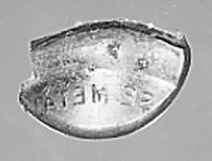 Figure 10.23 Bullet with imprint of lettering from back of watch case. Two cases with unusual marks on a bullet should be mentioned. The first involved a woman accidentally shot when the .25 automatic she was carrying fell to the ground and discharged. Etched on the jacket of the recovered full metal-jacketed bullet was the partial print of the woman. She apparently had handled the cartridge at one time, and the moisture and salt in her perspiration had corroded the jacket, with the resultant production of the partial print. In the second case, a bullet perforated the wrist of a woman, impacting the back of the case of a wrist watch that she was wearing. Examination of the bullet revealed mirror image impressions of inscribed lettering from the back of the watch (Figure 10.23).